It was a hard decision. So many people in UKIP deserve the title - David Bannerman, Paul Nuttall, Nigel Farage, Douglas Denny, Derek Clark, etc, etc. But after serious reflection it must go to ........... Mike Nattrass! For not telling UKIPPERS he was under investigation by OLAF. For threatening to sue the Sunday Times for publishing details of the investigation. Mike, you can't sue them for telling the truth! For wanting to become UKIP leader. For thinking for even ONE second that he could win. For claiming that the Sunday Times article was published in order to damage his chances of becoming UKIP leader. Mike, they couldn't give a damn about you becoming UKIP leader! For going on holiday to the Philippines during the leadership campaign. For allowing Derek Bennett to work for you. For allowing him to write press releases for you. That one about your humanitarian trip to the Philippines was hilarious. For carrying naughty photos in your wallet. For not taking your wife to Brussels. Now why is that? Mike can send his acceptance speech via the comments section of this blog. We look forward to reading it! Paul Nuttall interrogates East India Club cat suspected of supplying information to Junius. Not one of Lord Pearson's finest moments. It is interesting to note that Pearson claims UKIP is for 'individual thinkers'. What planet is he living on? In UKIP being an 'individual thinker' can get you into serious trouble. Just ask Del Young, David Abbott or Eric Edmond! We also note that the noble Lord is still trying to deny that he offered to disband UKIP in exchange for the Tories agreeing to a referendum on the EU. Silly man. Trying to spin such nonsense won't change the fact! Is Lord Pearson suffering from foot in mouth disease? It seems so. But at least he has his wife to watch out for gaffes! Oh, Lordy, Lordy. This is not going exactly to plan, is it? Lord Pearson of Rannoch, the newly elected leader of the UK Independence Party has had, to say the least, a rocky few weeks in office. He had only been in the job 24 hours when he ignited a row that still threatens to tear UKIP apart, he has been drawn into the expenses debacle and then there is the small matter of allegations of his involvement with a corrupt South American regime. 'Yes, yes, yes. It has been an interesting time. Not exactly a bed of roses, no,' he says, with a cheerful nod. On his first day in office, Lord Pearson annoyed many in the Right-wing, anti-Europe UKIP by saying that if the Tories promised a referendum on Britain's continued membership of the EU, he would disband his own party. 'A rather original approach to leadership,' as Glenys Kinnock dryly noted in the House of Lords recently. It has also come to light that Pearson has received £100,000 over six years by claiming that his £3.6million house in London was his second home. 'For tax purposes. That's not fibbing or anything. You know, the point I find impossible to get over to critics is what I have actually given up to do this,' he sighs, estimating that entering the House of Lords at Margaret Thatcher's behest 20 years ago has impoverished him to the tune of £200,000 a year in lost earnings. He says he is also losing money by selflessly leading UKIP. If he carries on down this spiral, he'll be as poor as a church mouse. Or perhaps not. Pearson's critics would argue that, to the contrary, all he has done is indulge himself by funding his pet hobby; politics. And as a millionaire insurance broker, he could well afford to take the drop anyway. 'No, I am not rich enough,' he says. He insists that all he owns is a London town house, a moor, a deer forest and a 12,000-acre country estate in the Highlands, plus a share portfolio worth around £2.5million and a pension fund with 'about' £600,000 in it. 'And that's it!' he cries. 'The house is worth £1.2million. Scotland is probably worth about £3million or £4million - but not unless you sell it. And then what do you do? Nothing? Lie on a beach? Oh, everyone is so anti-rich these days, aren't they? Why didn't you? 'I'm just not quick enough, I'm afraid.' How glad the uber-modern Conservatives must be that Pearson left their party years ago! At a time when David Cameron - rightly or wrongly - seems obsessed with de-toffing his party, the last thing he wants is someone like the flamboyant anti-Europe, pro-hunting, outspoken millionaire Malcolm Everard MacLaren Pearson, Baron Pearson of Rannoch, rocking the careful carpentry of his egalitarian boat. Small of stature, ruddy of cheek but loud of opinion, Pearson is the kind of unreconstructed Old Etonian dinosaur - 'My nickname at Eton was Malc The Knife,' he says, without a blush - who must give the Tory leader nightmares. He even says yah! when he means yes; practically a hanging offence in the modern political world. 'At least I am who I am,' says Pearson. 'David Cameron has given up shooting and hunting and he has resigned from White's. I mean, it is absurd. 'He is trying to show that he is something that he isn't - or isn't something that he is, let's put it that way. I am not going to do that. I can't be bothered to pretend. If people don't like it, then tough,' he adds, brushing the arm of his charcoal pinstripe suit. His shirts are handmade for the same reason. 'From Turnbull & Asser, I'm afraid. Whoops, there goes another headline,' he says. We meet in Pearson's South London home, a perfect Georgian town house in a perfect Georgian square and practically next door to one of the original 18th century sites of the House of Bedlam, where fashionable Londoners used to come to stare at the inmates. However, this is not Pearson's famously flipped home; this is the one he moved to in 2007 to save money. Lord Pearson and his third wife, the much younger, poetically named Caroline St Vincent Rose, 'downsized' here from his much grander, Grade II listed stucco house in Belgravia, situated in a square where Ian Fleming and Michael Portillo once lived. Part of the £2million the Pearsons made on the property deal was ploughed back into the running of Lord Pearson's ruinously expensive Scottish estate. The ground floor of the Pearsons' London home is all pale wood and white walls, with light pouring in from a conservatory-type extension to the rear. I count at least nine oil portraits of groupings of short-haired German pointers; a rapt audience of adoring doggy eyes which track your every move around the room. 'That's Jock, that's Fred who ran away, that's Suchard [named after the chocolate], that's Jock Junior, that's Fred's grandfather. ..' says Pearson, going on to point out the hunting dogs who live on his Scottish estate in a manner of which they would no doubt approve. In the dining area, there is also a huge landscape of gloomy Glencoe, featuring some Highland cattle grazing in the foreground. 'Oh, that's just Malcolm! He always likes to imagine he is in Scotland,' says Lady Pearson. Willowy and rather lovely, she pads around in her tight green jeans and furry Uggs, keeping a watchful eye on proceedings. She has no intention, she says, of being a 'political wife', but she wants to support her husband as much as she can. 'This has been his absolute obsession for years,' she explains. How does she think it is going so far? 'Interesting,' she says, and puts the kettle on. For his part, the leader of UKIP feels that he has three main problems. What he actually meant, he now says, is that his party would merely stand aside at the next General Election to avoid any potential split of the Tory vote and to help put David Cameron's Conservatives in a more powerful position. In return, they would get their beloved referendum, and once they got that, they would reform themselves once more. Disband didn't come into it. 'I didn't think I was suggesting anything particularly naughty as far as the membership was concerned. If we got the referendum, we are confident that we would win it. Then there is Costa Rica. Malc The Knife faces fresh questions about bribery allegations against his company Pearson Webb Springbett - the insurance brokers he co-founded 45 years ago - when it was operating in Costa Rica in the 1990s. Pearson sold the company last year, but has been helping an official investigation into allegations that PWS had bribed the then president of Costa Rica while allegedly overcharging the country for its insurance premiums. In his defence, Pearson has said his company operated by the normal South American business practices adopted by all international insurance companies at the time and that PWS had done nothing wrong. 'I knew my weak spots before I became leader of the party,' says Pearson, who also courted controversy earlier this year when he invited Dutch Freedom Party leader Geert Wilders to show the anti-Islam film Fitna before the House of Lords. In the end, Wilders was prevented from entering the UK on the instructions of the then Home Secretary, Jacqui Smith. In response, Pearson accused the Government of 'appeasing' militant Islam. Now he is cheered by other recent news from Europe. 'God bless the Swiss. Look at what they did the other day; they knocked out the wretched minarets. Wonderful!' he cries. At other moments, he just sounds rather terrifyingly like the major in Fawlty Towers and he concedes: 'I am a sort of loony. A rebel, a maverick. I was brought up in the wilderness of Rannoch which teaches you to think for yourself. 'I spent all my school holidays there, wandering the hills and that made me an original thinker. I think I am even cursed with a little vision. No, not a seer. I wouldn't go as far as that. Pearson was elected to office when former UKIP leader Nigel Farage, who is also a member of the European Parliament for the South-East, resigned in September to concentrate on his efforts to become an MP at Westminster. 'He is a Derby winner and I am a carthorse who puts his hooves in it sometimes, I'm afraid,' says Pearson. 'Be careful what you are saying, darling,' calls his wife. The Pearsons married in 1997, after knowing each other 'for ages'. They have no children together, but he has three daughters; one from his first marriage to Francesca Frua de Angeli and two from his second marriage to the Hon. Mary Charteris. His middle daughter has Down's syndrome and lives in a sheltered community. Over the years, Pearson has done much campaigning and political work on behalf of those with mental health problems. As if to emphasise his lordly domestic credentials, he has a minor fit when his wife serves coffee in mugs. 'A mug! Haven't we got a cup and saucer for our guest?' he cries, before absent-mindedly helping himself to one of my biscuits. 'Oh, I am not really a politician,' he sighs. 'To be honest, I did not want to be UKIP leader, but I came to see that I ought to try to do it. Indeed. Three years ago, David Cameron described it as a party of fruitcakes, loonies and closet racists . . .
'A somewhat puerile statement and churlishly rude of him, I think,' he says. 'But it helped us, in a way. It helped to bring a lot of people into the party.' It did? In many ways I can't help liking this terrifyingly accident-prone, self-consciously eccentric aristocrat. 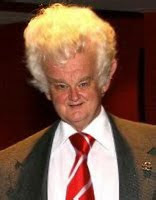 However, the question is, will anyone take this seer of a peer Malc The Knife, his ideas and his wealth, seriously? And what is he going to get up and do for the rest of the day? 'Just take the flak on my mobile,' he shrugs. 'Oh, do be careful, darling,' says Lady Pearson. The League of Empire Loyalists was formed in 1954. It campaigned for the preservation of white supremacy over the "Commonwealth". It was formed by disgruntled Tories, in an attempt to influence Conservative Party policy (where have we heard that one before?). It is generally remembered for its neo-Nazi associations - Colin Jordan, the leader of the British National Socialist Movement was a prominent member, as was John Tyndall, the founder of the BNP. Now it gets interesting.... again, Junius is privy to conversations in London clubs. Not the East India this time - we never really liked it there. 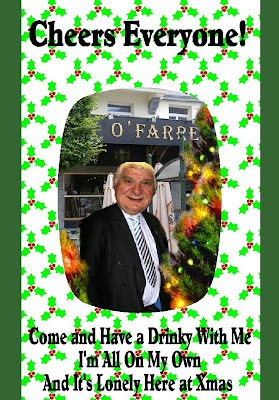 It is shabby, and the tatty old bar is frequented by smelly pipe smokers! No, this time to the Carlton Club, that bastion of conservatism. Discussion a few nights ago centered around the League of Empire Loyalists, and a particular faction, that fancied itself to be a part of Gladio, the Cold war resistance organisation. Our source, formerly a member of the League, now an elderly Tory businessman, told us about this faction. "A bunch of military fantasists - always totally pissed, and centred on the TA. Real weekend warriors! They fancied that they would defend Blighty from the Commies and the Wogs when the balloon went up!" Apparently, even Jordan and the other Nazis thought this lot to be bonkers. Because one of the leading lights of this clique was the father of a senior UKIP MEP. There has been been some discussion of this in the past, but now our friend in the Carlton Club has really allowed us to open this can of worms. A disgruntled Tory faction starting something new in order to influence Conservative Party policy? Drunken fantasists? Closet racism? Does it ring any bells? It seems it runs in the family! We at Junius note that the usual EUKIP liars and cheats are still losing sleep over the identity of Junius. Indeed, we have recently been the subject of some discussion on the British Democracy Forum. The list is getting increasingly longer with John West, Robin Page, Gary Cartwright and Adrian Muldew being added to the ever growing list of suspects. You may recall that Mark Croucher accused Piers Merchant of being Junius. Piers has now been dead for several months and yet strangely we are still here. We note that Croucher has yet to apologise to the Merchant family for publishing his lies. Croucher currently posts on the British Democracy Forum as 'Skeptyk'. In a recent post he once again accused Gary Cartwright of being Junius. You may recall that Gary used to work for UKIP as a researcher. Exactly what am I being accused of now? I was accused of leaking information to Greg Lance Watkins once, by David Lott and Nigel Farage. When as a result of my own investigations into the matter I showed them that only they (and Gawain Towler) had that the relevant information at the time it was leaked, it very suddenly became "well, actually, its not something we are here to talk about". Well. at least I had found the leak...! I was accused of selling a story about Farage's son to the Sunday Times. When I produced a letter from the ST to confirm that I was not the source, the leadership did not want to look at it... the lie had served its purpose. I lost my job as a result of that lie. Having found a new position in the European Parliament, I was then accused of being a member of the BNP, a cross-dresser, a closet gay, and - most insultingly - of having lied about my service record. This all came from the aforementioned "Mr S" and one of his chums. The allegations turned into threats, and I had to call in the police. The harassment then stopped. Mr S's chum was an ex-con, and so they probably realised it was a good time to stand down on this one. I was then informed that a certain UKIP MEP had been calling members in his region, and was alleging that I, and others, had been recruited into UKIP to destabilise the party. Apparently, I am an MI5/MI6 agent. Then, whilst I was subsequently working as a journalist in Brussels, my editor was viciously attacked on the platform of a train station by a young lady working for in the offices of the UKIP Brussels clique, who objected to a story "Gary Cartwright had written". I didn't write that story... it showed me the measure of these folks. Idiots, one and all. I was present when a young journalist was physically attacked by a UKIP MEP in a Brussels bar. I was attacked by a young intern for being "Junius". His behaviour was appalling. When Piers Merchant was "exposed" as Junius, did I get an apology? No way... again, it shows us the measure of these people. Piers is no longer with us, but Junius is still active. Has an apology been issued to Piers' family? You can guess... by now you will know the measure of these vile people. I walked past Farage's office a while back - his pa, who I once shared an office with, was there - I try to get on with everybody, and so I greeted him. I was verbally abused in the most obscene manner, and jabbed with an umbrella. So what am I accused of now, Skeptyk? 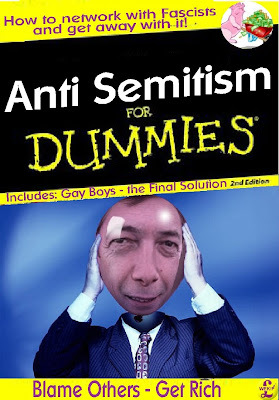 Gary's excellent post gives just a few examples of the serious problems within UKIP. To state that the corrupt and dishonest gain preferment in UKIP while the decent and honest are driven out by a corrupt leadership would be a colossal understatement! Happy Christmas from Derek and Mike! Junius was delighted to be privy to a drunken conversation in the East India Club… The truth about why Nigel Farage resigned the UKIP leadership can now be told. The somewhat noisy tantrum thrown by Marta ‘the Martyr’ Andreason at a meeting of the NEC, which culminated in her resignation as party treasurer, was just the start of a series of events that spelled the beginning of the end for Farage’s grip on UKIP. 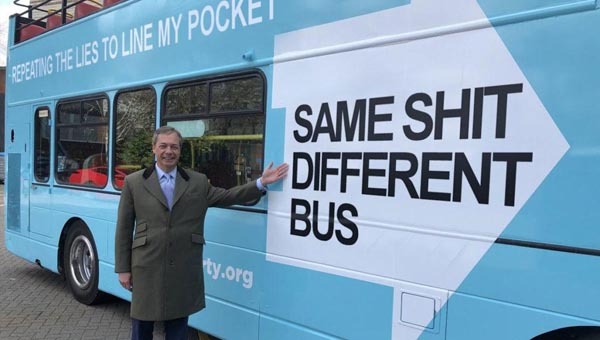 So Farage obliged, but not before ensuring that his replacement vehicle, a pan-European political party, was taking shape. You have to admire the man, he handled it well. If only his mates hadn’t got bladdered and talked too much at the bar. Incidentally, Marta also talked to one of her old chums in Paul Van Buitenen’s office. 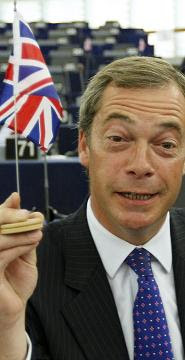 PvB hates hypocrites, and Farage can expect some bad times in Brussels as a result! Cheers, Marta. The Junius Team would like to wish all our readers a very Happy Christmas. 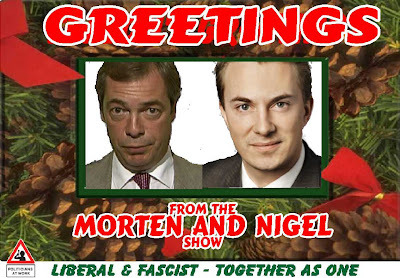 We can guarantee you that Nigel Farage won't be having a very merry one after reading a certain email! Italy's influential Northern League Party has stood out over the past decade for its particular knack in finding new (and not-so-new) ways of offending people based on country of origin and color of skin. In 2003, Umberto Bossi, founder of the party, which once espoused separatism, told an interviewer that police should open fire on the boatloads of undocumented Africans arriving on Italian shores, calling the would-be immigrants "bingo-bongos." Other Northern League pols have proposed everything from separate trains for immigrants to banning the building of new mosques and even prohibiting the serving of kebabs and other non-Italian food in city centers. 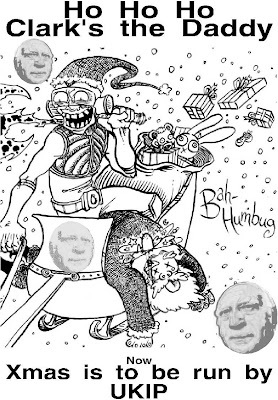 The latest swipe by the Northern League attempts some kind of holiday spirit. The league-led city council in Coccaglio, a small town east of Milan, has launched a two-month sweep — from Oct. 25 to Dec. 25 — to ferret out foreigners without proper residency permits. It has been dubbed Natale Bianco, or "White Christmas." Claudio Abiendi, a longtime Lega Nord member who leads security policy on the city council, told the daily La Repubblica that he came up with the initiative as a way "to start cleaning things up" in Coccaglio, a town of 7,000 with some 1,500 immigrant residents. "For me, Christmas isn't the celebration of hospitality, but rather of Christian tradition and our identity," he said. Abiendi also told the paper that approximately half of the 150 inspections already carried out turned up people who no longer had a right to reside in Italy. He said he would report them to national authorities. The city council office is responding to requests for interviews with a press release denying any racist intent, noting that the Natale Bianco moniker was not an official public designation. The impromptu local census "was born to know the real number of foreign-born citizens present in Coccaglio so as to better manage the economic resources destined for integration projects." Local officials say the measure follows a national policy set forth by Italy's Interior Minister, Roberto Maroni, a member of the Northern League, to give local administrators more authority in monitoring the residency status of foreigners. The Northern League, founded in 1991 on a platform to separate the richer northern regions from the rest of Italy, is as strong as it has ever been. It is now a key ally in Prime Minister Silvio Berlusconi's majority in Parliament after garnering 10% of support in the last national election on a campaign focused on deepening worries about crime and the economy. Last week, the league floated (but then withdrew) a measure in Italy's budget bill that would have capped unemployment benefits for foreign-born workers. Both the economic scapegoating of immigrants and the vision of the league's White Christmas irk the Comunita di Sant'Egidio, an influential Catholic lay group that defends immigrant rights. "The insults and rhetoric help to exploit uncertainty and create political consensus," says Mario Marazziti, Sant'Egidio's spokesman. "But in the end, it is against the national interest. Italy is in demographic decline, and the only real chance is to work to integrate immigrants, who are the last hope for the country to start to grow again. All the rest just creates conflict and puts off resolving this crisis." Indeed, even as the Northern League continues to cite Christian themes in its opposition to a growing Muslim minority, Pope Benedict XVI on Nov. 27 presented the annual message for the upcoming World Day of Migrants and Refugees. "Jesus' words resound in our hearts," he said. " 'I was a stranger and you welcomed me,' as, likewise, the central commandment he left us: to love God with all our heart, with all our soul and with all our mind, and to associate this with love of neighbor." Now that is a different kind of Christmas spirit. The Lega Nord are members of UKIP’s Freedom and Democracy Group. Lega Nord even have a paramilitary wing known as the greenshirts (camicie verdi). To say that some of UKIP’s MEPs are unhappy joining forces with the LD would be an understatement. Some have already threatened to leave the group. It is interesting to note that the odious Paul Nuttall - who would not even stay in the same room as Nick Griffin - is more than happy to embrace his European racist, homophobic and anti-semitic allies. The words stinking hypocrite spring to mind. One wonders what Mark Croucher - self-proclaimed anti-fascist warrior, Searchlight supporter and EFD Press Officer - makes of all this? Perhaps someone should report him to Searchlight for his pro-fascist activities? And don't be too impressed by quality of the video. UKIP did not make it. They paid a company to put Farage's photo on a pre-existing video. It is interesting to note that the title of the video is 'A Hero for Europe'. 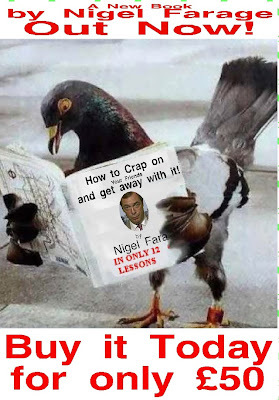 Nice to see Nigel promoting his pan-European credentials! 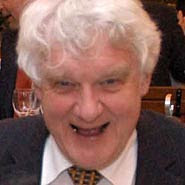 Simon Muir was the organiser of the UKIP Bristol conference back in 2004. Start with UKIP. When you have a set that might be a viable opposition or government pro tem, then the others become the target. Why do I get so exercised about them? Because they are so FFFFing USELESS! And they need not be, apart from the corruption, and Farage-the-puppeteer messing up everything because he only sees intellectual equals as a threat. Only the blind or stupid would waste time on them presently, and the sad thing is that they don't care about the depth of the betrayal, because nobody in the party wants to be honest about their true position. - Spot the Economist. First person to score 0 is the winner. - Spot the Politician. Same rules as above except the scoring is 1. - Beat the Bishop, er MEP: Sit him/her in a chair and hit him once with a rolled up newspaper for every bit of wasted expense and irrelevant posturing in the EP. Stop when the police arrive, or your arm gets too tired. It's twelve years since I was persuaded that UKIP were the only hope for the future. Since then, in actual measurable terms, all that's happened is that the party's grown fat on EU handouts, and, under Farage, reneged on its constitutional promise about withdrawal etc. With one or two honourable exceptions, such as Alan Woods and Denis Brookes, nobody has come even close to winning a real, FPTP, election. Such is the REAL impact the party has made. As for claims they frighten the Tories: they evidently don't bother Cameron - his leadership is arguably more pro-EU than even John Major's cabinet was, and he's just slammed the door on a referendum. He's obviously terrified UKIP will steal Tory seats, not! Insiders suspect too, that there are enough people who know where the buried UKIP bodies are to trash the party's election campaign. Tom Wise probably won't be the last UKIP MEP to have his collar felt: any manipulative anti-UKIP functionary would be saving the best till last. Be sure that any dirt the Tory press have to spread around won't be used now, when UKIP might just have time to recover before the vote. It will 'surface' two weeks before polling day, so that every UKIP candidate spends a fortnight defending the indefensible, before their inevitable electoral wipeout. Do I sound angry & betrayed? You bet. The likes of Ken Clarke make their betrayal of the country no secret, in a sort of perverse honesty. You can hate them but you cannot misunderstand them. UKIP, in contrast have taken the trust, time and effort (and money) of thousands of people like me and wasted it. On that theme, what about the poor saps picking up the HUGE bill for UKIP's rudeness to the Electoral Commission? How many UKIP people know the matter could have been settled out of court for LESS than £20,000? It might even have cost nothing at all, had simple courtesy been observed from the start. There is a timeline and detail of the whole farrago in the public domain, for anyone who cares to look. Let's think: would it be better to spend £1m campaigning, or to hand it to a Labour government as a fine? Nope. It beats me too. Meanwhile, UKIP's words remain weasely and they evidently have NO PLAN, and NO IDEA how to actually DO what they claim they want to do. Oh, and should the best anti-EU defence we can muster in these islands be the racist thuggery of the BNP? Ten years ago, UKIP's membership was climbing and the BNP's diminishing. What has happened since, and why? I'd like UKIP GONE as fast as possible, so we can start again with something true and honest, that people might actually ELECT. "Vote Tory to save the country; a vote for either of the other two means you'll get five more years of the same communist destructiveness." They'll circle the wagons and make no direct reference to UKIP unless forced to. The 'do you want to split the vote?' argument will keep the faithful on-board, PRECISELY BECAUSE UKIP IS SO USELESS. If there was any risk of a decent campaign being run, or a shred of joined-up and sensible policy, UKIP might make headway. But there isn't and it won't. A vote for UKIP is simply a wasted vote. You might just as well scribble profanities on the ballot paper, for all the good it will actually achieve. Where is the EGM to put the party right? Why aren't people demanding Farage personally pays for the court case? Where is the plan? What are the fat MEPs doing TODAY to get the UK out of the EU (hint: are they on expenses in Brussels or fighting the battle here, where it actually matters?). WHAT SINGLE ADVANTAGE HAS THE INDEPENDENCE MOVEMENT GAINED FROM UKIP MEPs GOING TO BRUSSELS, ON ANY OCCASION, EVER? The battle is here, not at enemy HQ. How could anyone ever think otherwise? But where is David Bannerman, Mike Nattrass, Mark Croucher and Annabelle Fuller? With thanks to Andrew Edwards. We would like to thank one of UKIP's MEPs for passing this on to us. The spelling and spacing mistakes are as the original. Considering how much Farage makes as an MEP we would have thought that he could have at least found someone able to write something that looks competent. Doesn't he realise how unprofessional such a badly written email makes him look? Or is he just too drunk to care? Thank you for your message, to Nigel Farage, about the deterioratingsituation, in several parts of Africa, and recommending action by theUN, the EU and HMG, to remedy this. s is, under its current management, a suitable custodian, orwhether it serves rather the great financial interests, which underpinit, at the expense of peace and genuine development in the Third World. The EU's predatory "Economic Partnership Agreements" (EPA's) the IMF'smanipulative loan-conditions and the UN's undisciplined mercenaries,should be replaced, in UKIP's view, by equitable, conservational,development-agreements (such as the one proposed by Guyana) which couldwork to the benefit of all concerned, rather than - as with the presentarrangements - acting to coerce, bribe and de-stabilise, under the cloakof humanitarianism, woven by our media. In many respects, this is not just UKIP's view, but that of severalcharities in the field, such as the World Development Movement. 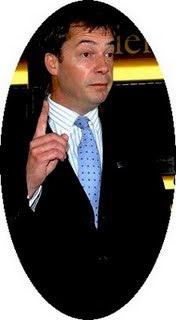 In any event, UKIP's position, regarding the mooted EU-battlegroup forthe DCR, is conditioned essentially by the consideration that theEuropean Union lacks the democratic accountability necessary to avoidits becoming a fearsome autocracy, endangering freedom, justice,prosperity and peace, not just in Europe, or Africa, but in the world atlarge. Douglas Denny - Himmler lookalike, Cuban boot fetishist and complete idiot - has been denying this week that Del Young was thrown out of UKIP after refusing to sign a letter confirming that he was not a member of UK First. Seems straightforward to me where the direct responsibility is for his not being in UKIP .. and it is not with UKIP. No "kicking-out" there ............and a far cry from the Eric Edmond lie that "He was effectively kicked out by Nuttall on false evidence". Taken from the British Democracy Forum. End of letter. How appropriate that the letter was sent on April Fools Day! FACT. Mr Denny is a liar. FACT. Mr Young WAS never a member of UK First. He confirmed this to the odious Paul Nuttall during a rather heated telephone conversation. Despite this he was still thrown out. So there you have it. No chance for an appeal or a hearing. Sounds very much like Stalin's Russia to us. But at least with Stalin you got a show trial. In UKIP Mr Young didn't even get that! And Farage and Nuttall have the gall to claim that UKIP believes in democracy! It is also interesting to note that Trevor Colman promised to join UK First if he was elected to Brussels. Perhaps someone should tell him that he has been an MEP since June. So why is he still in UKIP? We at Junius are the first to praise those that deserve praise. Gerard Batten opted to remain on the old lower salary saying, “in a time of economic crisis when many of my constituents are in fear of losing their jobs, and when politicians’ reputations have never been lower, I did not feel it would be justified to take an increase in salary of almost £19,000 per annum. Gerard said, “In times when people are fearful of losing their pensions how could I justify taking a pension that is not available to my constituents and for which I do not have to pay contributions?”. But what about the likes of Nigel Farage and David Bannerman? They are too busy grabbing the extra cash to care about the people who elected them. And what did happen to the £2 million Nigel claimed in expenses? And what about the time Farage managed to spirit away £211,000 as 'miscellaneous expenses' from his Constituency Office? And what about employing his wife on £30,000 a year? What DOES she do for that large sum? And don’t forget the money raised by the Ashford Call Centre. Where did all that money go? It is interesting to note that Michael McGough - serial liar and not the PPC for Harlow - has been highly critical of Batten's decision. He has said that Batten should have taken the money EVEN after voting against such a pay increase. Such is McGough's morality. He has also gone on record as saying "If you wish to be moral don't go to Brussels and Strasbourg period!" As many will remember Ms Sinclaire is still committed to donating a third of her salary to UKIP. And what about the likes of Farage and Bannerman? They are too busy sticking their snouts in the trough to even consider following her example. Nikki has had a hard time recently. Nigel Farage has behaved disgracefully towards her. He has made numerous threats about leaking stories to the press - including the story about her bankruptcy - unless she obeys His Highness. Poor Nigel. Someone should have told that GLW had featured this non-story on his blog after a source VERY close to Farage leaked it to him in the hope that he would smear her. They failed. A word of warning to Mr Farage. We know that Croucher - acting on YOUR orders - is behind these smears against her and we are not going to take the bait! Does ANYONE out there still think that Nigel is a decent and honest man? He is representing UKIP and their associates in the EFD. How ironic! The self-proclaimed anti-fascist warrior is now quite happy to represent fascists such as the Lega Nord! What will his friends at Searchlight say about this U-turn? Clearly Croucher's anti-fascist credentials are dictated by the size of his pay cheque! Farage is abusing his position as chairman of the EFD in order to deliberately smear a fellow MEP. This is in direct opposition to a guarantee given by Lord Pearson to several members deeply concerned by Farage's stranglehold on the party. Just what kind of insanity is being nurtured in the office of Nigel Farage? This extraordinary e-mail, sent from Farage's Brussels office on November 3rd, suggests a tortured and confused mind. Are UKIP members really happy that innocent members of the public, taking up their right to correspond with elected representatives, are receiving insane gibberish like this? Is there a policy of poor grammar and spelling mistakes in Farage's office, or is the author of this missive simply poorly educated? Most people regard UKIP as a bit of a joke - this explains why! Many thanks for writing to members of the EU's contemptible consultative assembly about this absurd , but cleverly sold and intentionally oppressive, piece of EU-legislation. Most of the EU-assembly's members are careerists, or fanatics, who would, and do, vote for anything the EU-Commission proposes, because they see the EU as their milch-cow for life and as an un-challengeable empire, which will give them ever greater privilege and wealth - if not any real power (which is all at the EU's Council, Commission and Court and in the EU's client-governments) UKIP's representatives, of course, did not vote for this nonsense about "day-time running lights". They vote against the entire gamut of the Commission's wicked proposals, and are very glad to hear that they have your support, if only in this instance. The truth is, however, that you cannot pick and choose, which EU-legislation you will be subjected to. You can either support UKIP and a policy of scrapping it all, or you can support one of the other parties and, as Edward Heath put it, "swallow the lot". Lord Pearson was rather surprised by the recent critical newspaper articles. 'the subsequent media attention came as quite a shock to the system at my age'. He would be even more surprised if knew who was behind the leaks - a member of UKIP's press office! Some of his fellow lords were quite amused by Malcolm's offer to disband UKIP. They were even more amused by his attempts to rewrite UKIP history. According to the Farage approved version it was all a cunning plan to expose the Tories as supporters of the EU! So tell us something that we didn't know! So why was Lord Pearson upset that the offer had been rejected? And why was he angry when he discovered that the offer had been leaked to the press? But why be angry? According to the latest UKIP spin the Tories fell for Nigel's cunning plan. Lord Pearson should have been pleased. And remember Pearson's statement to the BBC? "We offered that if we got a clear, written promise with an agreed wording for a referendum on whether we stayed in or left the European Union... then we would stand down for the general election, providing we had this absolutely clearly in writing. "And then when we had the referendum - which we believed we would win - we would then be out of the European Union and then at that point UKIP, well it would have been up to UKIP, but it would probably have disbanded because its major point would no longer be in existence." How strange? No mention of making the offer in order to expose Cameron's support for the EU! Here's a bit of advice for UKIP's new leader. If you are going to attempt to spin your way out of trouble do try to make it sound believable ! UKIP leader Malcolm Pearson today confirmed that he was retaining David Campbell Bannerman as the Party Deputy Leader. "I am delighted to reappoint David", said Lord Pearson, "I know he has been an invaluable asset in the role previously, and will continue in that vein." We are not surprised that Lord Pearson decided to retain a serial liar as Deputy Leader. Nigel still pulls ALL the strings! We note that Bannerman is still claiming bogus links to a former prime minister. When will he ever learn? 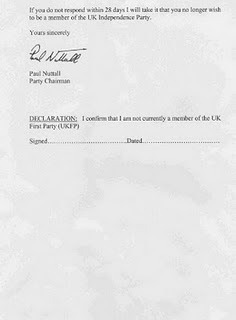 Is Lord Pearson aware that Bannerman has built his entire career in UKIP on a lie? Is he aware that the Eastern Region MEP selection process was rigged to favour Bannerman? Is he aware that Bannerman actively supported the expulsion of democratically elected members from UKIP's NEC? He even provided a dossier of fabricated evidence to support the removal of Dr Eric Edmond. Bannerman is just another example of a failed Tory politician who joined UKIP in order to jump on the EU Gravy Train. He is a political pygmy without a shred of integrity. His patriotism is dictated by how much money he can earn while keeping his snout firmly in the trough. That the new leader is happy to keep him as chairman hardly suggests that he will be a new broom! Turnout for the UKIP leadership election was 74%. This puts the party membership at 13,439. Didn't Nigel do a great job as leader! Nigel Farage - UKIP's very own emperor Commodus in more ways than one! Commodus was paranoid, incompetent and a degenerate. Sound familiar? But is Lord Pearson destined to be our Romulus Augustulus? The last leader of a once great empire? And now you know why UKIP was not crowing about a surge in membership requests after the Euro elections. Then why not consider buying a bus for Christmas? One less than careful owner. No longer needed due to imminent collapse of party. Paintwork needs touching up. Phone 0207 4037174 and ask for Gerard or Tim. Steve Reed: UKIP's very own "Swivel-Eyed Loon"
Climate change denial events are always guaranteed to attract more than their fair share of oddballs, but last week in Brussels the world was presented with what can only be described as the ultimate "Swivel-Eyed Loon" event. The main speaker was Chris Monckton, the ill-informed Marty Feldman look-alike, who never let a fact get in the way of a good rant. BNP leader Nick Griffin, who can be excused for looking two ways at once (as he only has one real eye) appeared to be accompanied to the event by one of Brussels most infamous swivel-eyed loons - Nigel Farage's Brussels pa Steve Reed. Stevie boy was once caught out fly-posting in Brussels for Vlaams Belang, but despite the efforts of his Euro-employers to get rid of him, Farage covered his backside. Reed is also understood to have been present at the recent BNP/UKIP remembrance day parade in Brussels, with Nick Griffin and ex-National Socialist Movement member Andrew Brons. Many of you have concerns about recent media coverage, and I want to answer some of them now. We did anticipate that sections of the Conservative Press would attack UKIP in general and the new leader in particular. We were proved right and I must admit to a certain satisfaction at having drawn fire so quickly. Naturally some media stories will be written to deliberately upset members and lose us future supporters. They will sometimes be false and frequently twisted, or 'spun' and there will be more of them. They are now out to get us, and we should be flattered by this overt recognition of the threat we pose. My appeal to each of you is to keep your nerve and treat the media with the caution it richly deserves. Now for a few facts. The word "disband" has been taken out of context. In a long interview for the Times profile last Saturday, I was looking forward to the great day when we are out of the EU, after winning an 'in or out' referendum (a referendum delivered by Cameron after we had stood aside and helped him into 'Government'). On that day there would have been a complete realignment of British politics, led by a triumphant UKIP, with the political class rebuffed. It is in thinking about this happy prospect that I may have used the 'disband' word, and if I did it was a mistake and I shouldn't have done so. The party will never be mine to disband. That is a matter for the members alone. As for the proposed deal with the Conservatives to stand aside at the 2010 election only, we knew that David Cameron was most unlikely to accept, because he is fully committed to membership of the EU. That's why he does not want an In or Out referendum. But - and this is important- we had to ask. By rejecting the deal he has proved that he would rather risk losing the next general election (because of UKIP's participation) than consult the people of Britain on EU membership. Next time a Tory cries: "Vote UKIP and you'll let in Labour," you can reply: "We gave them the chance and the Conservatives refused it. Roll on the election." I feel this has turned out to be quite a coup for us, and we should be shouting it from the rooftops. We put our country before our party and they did the opposite. I must also settle any worries that UKIP is merely the eurosceptic wing of the Conservative Party. This is not true. Under my leadership, UKIP will continue to target seats right across the political spectrum. The Labour vote will collapse at the next general election, and we must go all out for it as well as for that of the Lib Dems, many of whose members do not realise how Eurofanatic their party is. I am proud to be the leader of such a marvellous Party. Shutting the stable door after the horse has bolted springs to mind. Fact. The offer to the Tories was made in earnest. Lord Pearson was most upset that it was rejected. He would have disbanded UKIP for the General Election and asked UKIPPERS to campaign for The Tories. So much for being an alternative to the old party system! It is no surprise that UKIP HQ has been inundated with complaints about the offer. Many members have threatened to resign. This **** about showing the Tories up for what they are is just ******** your average man on the street doesn't care two hoots what the Tories do about the EU. This offer is an insult to all of the hardworking grass root members who have trudged the streets for what they believed to be a true alternative to the Lib/Lab/Con and I for one will not be renewing my membership unless I see a dramatic push for UKIP to be recognised as a party with a full manifesto and with core values that reflect the needs of the British people. How ironic. For years Mr Padmore has been defending corruption and dishonesty in UKIP. At long last the scales have fallen from his eyes. How foolish must he now feel! And don't forget that the offer was made WITHOUT the knowledge of several UKIP MEPs and the bulk of the membership. And Lord Pearson should remember that the Guardian and Observer featured damaging UKIP stories following his election as leader. We were not aware that they had suddenly become Tory supporting newspapers! 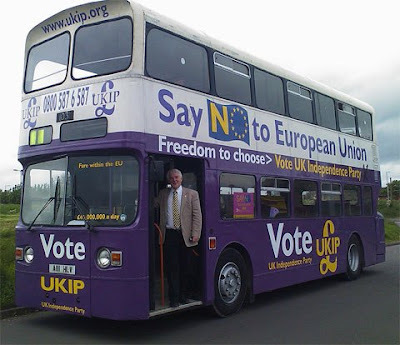 We were saddened to hear that the UKIP bus has been stolen. Fortunately a passerby managed to photograph the thief just before he drove off. Do not approach this man as he is considered a liability and could drag you down with him. COCOBU is the European Parliament's committee for budgetary control. It is the committee through which, we are told, Marta Andreason will expose the wrong doings of the evil empire. This claim is a tad flawed. Marta did manage to drag herself into the office early on Wednesday - about 9 am - but that is as good as it got! She strolled into COCOBU where the first item on the agenda was the "Discharge 2008 : EC general budget - Section III - Commission and seventh, eighth, ninth and tenth European Development Funds (EDFs)". This was, of course, mind numbingly boring. But that never worried the great whistle-blower. She left after 15 minutes, (after signing in, of course). She never came back. Such an easy day's work she had at taxpayer's expense! You thought no-one would notice, didn't you sweetheart! The meeting actually became very interesting. There were some very serious discussions about OLAF investigation procedures, and we are sure that Nutty Nattrass would have found this useful, especially as it related to time-frames that might affect his own case. But never mind, neither he nor Marta could be bothered to listen. So what. At least she wasn't on the lash with the rest of the UKIP team, who turned up in Brussels en masse - drunk - late on Wednesday evening. Its always very interesting to learn how UKIP spend the taxpayer's bucks.